The Olde Victorian Bulldogge is a medium sized to large-medium sized, smooth-coated dog. It is large headed with thick bones that do not impede vigor. It has a broad muzzle with a short face, but not too short to hinder breathing capabilities. Hindquarters should be slightly higher than the foreparts. 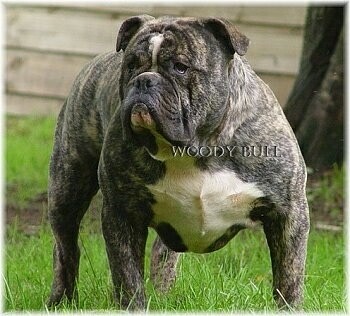 The Bulldogge should have a symmetrical body and be well muscled. The head should be large without being out of proportion to the body. Cheeks should be well defined and rounded. From the stop to the end of the muzzle should measure 1.5 inches. The muzzle should be noticeably turned upwards, well defined with good wrinkle; the wrinkle should not be too loose with excessive folds over the nose; the bite should be undershot without excess and square. Nostrils should be large and wide; black preferred. The teeth (canines) should be set wide apart and large. Eyes from the front are set low and wide apart. Eyes should neither be bulging nor sunken. Ears are rose or button; ears should not be erect or cropped. The most defining part of the breed is that it should be as great in circumference as possible (circumference should be equal to height, more superior bulls will have greater circumference of head than height). Circumference of head of females will not be as large as males. Cheeks should be well defined, showing power; definition of cheeks to be considered by age of Bulldogge (this feature gains more definition with age); 2 to 3 years final maturity. Too much attention should not be placed on this feature in a young Bulldogge. Jaws should be as follows: lower jaw projecting further than upper jaw which will give the jaw an upward turn. The bite should be square. Tusk (Teeth): Canines should be wide apart with smaller teeth set in between canines. Lips should be loose and heavy (without being sloppy), hanging below jaw, should be full in appearance. Nose must lay well back, large, broad and moist; perfectly black preferred; partly colored or Dudley noses are not preferred but are not a disqualification. Eyes are set as far apart as possible; eyes should be large without bulging; eyes should be perfectly set (equal on each side) from the middle of the skull. The ears should be rose shaped (short, small and fold more to side) or button (semi-pricked with forward fold). The stop is the indentation between the eyes. The stop should be deep and wide, it should extend to the skull; this feature gives the skull a square appearance. The deepness of the stop gives more definition as to how the eyes and ears are set. Thick, strong and arched, with loose skin forming dewlap on each side, the neck should be short, not having a long appearance at all. Bulldogges should have what is called a bull-neck (thick, muscular and Short), not a goose-neck (overly long or little muscle), which would show no strength or shape. The shoulders should be broad and deep. The chest should be well sprung and deep. A rise to the rear is desired as long as it is not in excess, making the symmetry of the dog suffer. Forelegs should be muscular, straight and wide apart; a slight bow is not a fault unless it is in excess with elbows turning outwards. The Bulldogge should be up on his pastern and the pastern should be strong. Hind legs should be muscled showing power, hocks slightly bent, feet round and compact. Chest is as wide and deep as possible with ribcage in proportion. Ribs should be round. Loins should be powerful with tuck-up that does not take away from the cobby appearance. Either straight, turning down, or screwed. The tail should not be carried over the back. There are no deductions for a docked tail, as it has no bearing on the quality of the dog. Hind legs should be higher than the front legs without exaggeration, they should turn out at stifle (knee) without excess which causes hock to turn inward slightly; the feet are longer than the front feet and are compact. Forelegs are shorter than the hind legs; forelegs should be powerful and can be straight or bowed (without excess). The forelegs should be turned out a little at the shoulder so that the body can swing. Should be straight at the pastern, feet should be large, moderately round. The toes should be split without being splayed. There are no deductions for tight toes. Colors include: brindle/white, all other brindle (including black/brindle), solid white or pied, fawn or tan. Solid Black is an undesirable color. Blue is not an original color of the Bulldogge, but is allowable. When judging the color should not play a factor in the quality of the dog; the color of the bulldogge should not be considered except in cases of equal merit. The undesirables would then take second. The coat is short and close; it is very smooth and silky to the touch. The Olde Victorian Bulldogge is a loyal, well-tempered, steady dog. He gets along well with other family pets when raised with them and loves children. He is brave and protective. He saves his deep bark for really important matters. He is large and strong. If he senses his owners are not as strong minded as himself he can become stubborn so strong leadership is advised. As a puppy, they will chew everything they can find. The Bulldogge should be steady, loyal and true with a dependable nature. He should be bold without aggression. The objective in training this dog is to achieve pack leader status. It is a natural instinct for a dog to have an order in their pack. When we humans live with dogs, we become their pack. The entire pack cooperates under a single leader. Lines are clearly defined and rules are set. Because a dog communicates his displeasure with growling and eventually biting, all other humans MUST be higher up in the order than the dog. The humans must be the ones making the decisions, not the dogs. That is the only way your relationship with your dog can be a complete success. Slow development of joints (joint supplements recommended). Entropian is rare but because of wrinkles can occur. Cherry eye is also rare but can occur as well. The Olde Victorian Bulldogge is good for apartment life. These dogs are inactive indoors and should at least have a small yard. They handle the heat and cold weather really well, but when temperatures are extreme, shade and fresh water are recommended. The Olde Victorian Bulldog can walk for miles, and should be taken on a daily walk. In fact, they demand good exercise and would love a good run. Because of the downfall of the modern day bulldog, the re-creation of a better Bulldogge was started. The OVB was developed by Carlos Woods and the development of the OVB began back in 1988. The OVB comes down from English Bulldog, American Bulldog, German Boxer, Staffy Bull and the Olde Bulldogge.